TL; DR: With Premiere Elements, you don’t need to go to Hollywood to become a filmmaker. 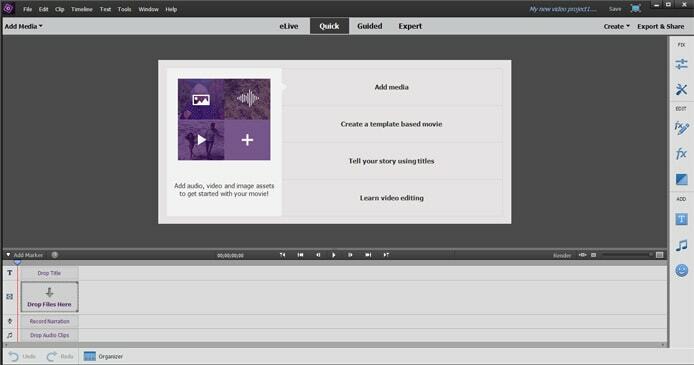 Adobe packages high-powered features into a novice-friendly, consumer-level video editing program that empowers everyone to make and share videos with ease. By automating and organizing much of the editing process, the new tools in Premiere Elements 15 help you shine the spotlight on your business, product, or memories. We outline our favorite features and share the resources that will help you use them. As a young Online Content Producer, I was told to make videos and get them online. The only problem was I knew how to write articles and develop websites — not make videos. As bosses often do, mine pointed me to the computer set aside for editing and walked away. I was on my own to figure out the video process from shooting to sharing. Thankfully, Adobe Premiere Elements held my hand and showed me how intuitive, powerful, and flexible the video editing experience can be. Weeks later, I was creating and sharing videos from my laptop as a coworker drove down the highway. A trusted brand for both developers and consumers, Premiere Elements wraps powerful, high-tech functionalities in a user-friendly interface to deliver an ideal mix of performant and accessible video editing. Don’t let the consumer-level classification fool you — Premiere Elements is a robust and efficient platform for creating high-quality videos. Pared down from the professional product, Premiere Pro, Elements focuses on usability without burdening users with complex features they won’t use. Although Premiere video editors have been around since 1991, Adobe separated the professional and consumer audiences by releasing Elements in 2004. Development has continued on each product separately, with updates coming every fall. Premiere Pro, used to edit Gone Girl, is meant to compete with the likes of Final Cut Pro, while Elements targets iMovie. Unlike Apple’s entry-level video editor, Premiere Elements handles unlimited video and audio tracks and provides different editing modes that cater to each user’s level of experience. For added media editing functionality, you can often find Premiere Elements bundled with Photoshop Elements. Adobe Premiere Elements balances powerful features with an incredibly intuitive interface. Product Manager Komal Desai has worked with Adobe for more than a decade and enjoys harnessing the creative power and reputation of the Adobe brand for beginners, consumers, and hobbyists to enjoy. Adobe unveiled the annual update to Premiere Elements in October 2016. Version 15 emphasizes easy and automated organization and editing — Elements does the heavy lifting so you can focus on creating and sharing, according to the press release. The guided editing mode offers a series of built-in tutorials that take users through specific tasks. Covering the basics, such as trimming clips and adding transitions, to special effects and animations, guided edits exposes and simplifies steps to the video process by pointing out where to click and what to adjust. The new Adjustment Layer of guided editing helps users apply effects across multiple clips to give your project a unified look. Once you apply the adjustment layer to your clips, you can correct colors and toning or steady the images by selecting Shake Reduction. The effect will be applied to every clip in the adjustment layer. Originally a Photoshop feature, the Haze Removal tool appeared in the previous version of Photoshop Elements before finally making the jump to Premiere Elements. The feature adjusts for environmental or atmospheric conditions that affect how your raw video appears on the screen. 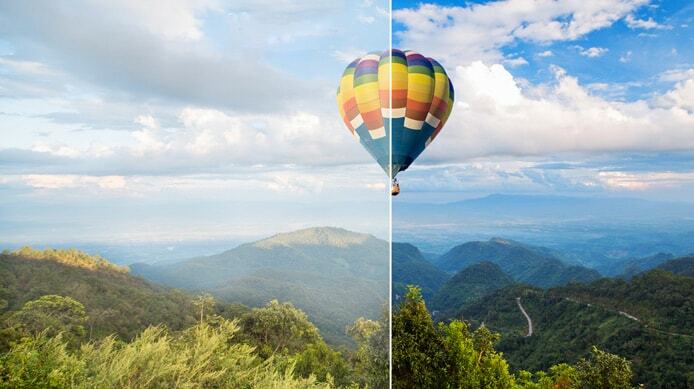 The ultra-simple Haze Removal tool makes colors pop in shots of the great outdoors. Useful for just about any outside video clip, Haze Removal tweaks the definition for distance, humidity, and clouds to make your background as sharp and vibrant as possible. By dragging the effect onto your video’s timeline, the correction can be applied automatically or manually. Once the video has processed, you can either reapply the effect or adjust the reduction or sensitivity with sliders to achieve your desired result. Want to add a soundtrack to your movie masterpiece? The Remix feature removes the frustration of matching the differing lengths of music and video files — no more abrupt endings or awkward fade-outs. The handy tool uses natural sounds and transitions to shorten or lengthen any music file you own to the exact duration of your movie. The Remix feature identifies loops, transitions, and important parts of the music and determines what to add, delete, shorten, or extend to meet your requested length. You can specify a preference for how many adjustments the Remix tool should make. 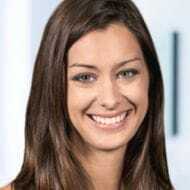 Face detection technology is nothing new to capturing photos and videos, but Adobe continues to expand how the feature contributes to the editing process. In Elements 15, Face Detection prioritizes the people in your videos when suggesting places to trim your video clips. You can also pan and zoom within still images to make sure everyone gets their screen time. According to Komal, the ability of Premiere Elements to automatically detect people and favorite moments speed up organization and editing time dramatically. Premiere Elements lets you share multiple photos and videos at the same time by bringing up to seven video clips into built-in Video Collage templates, which are customized by the number of media openings and the effects applied to each spot. Perfect for everything from social media to family gatherings, video collages can show multiple angles of the same event with an incredibly easy drag-and-drop interface. You can trim footage, adjust positioning, and pick from various templates to mix up the layout and animation. Also, choose to play each clip simultaneously or sequentially. Various exporting options let you further customize the collage for social media or other platforms. Beyond a plethora of guided edits, Premiere Elements makes features and tools readily available through multiple resources. Short videos cover every step of the creation process, from importing raw files to sharing the finished product. Complicated or new features are illustrated and explained flawlessly, exposing users to new functionalities. To dive deeper or find something more specific, Adobe’s help centers include some of the industry’s most comprehensive user guides and instructions. In addition to step-by-step directions, the website includes troubleshooting assistance and community forums specifically targeted for Premiere Elements. According to Komal, user experience and feedback drives development decisions about what new features to create and release.